What underpins the success of this My Backyard Garden Project is that this is a 100% TEAM EFFORT. 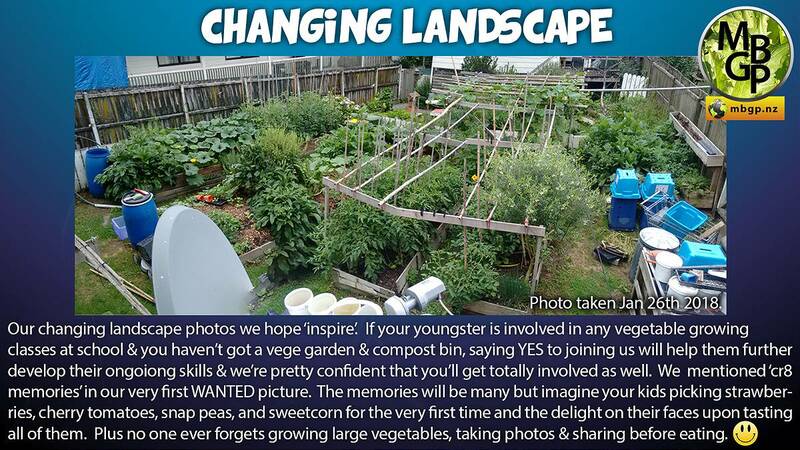 By this we mean we all help each other build a garden [either family or community] before moving on to the next. This characterises the cliche 'many hands make light work'. May 28th 2016 was the 'live' launch date of My Backyard Garden Project [mbgp] in West Auckland. The idea was to source FREE materials, i.e. 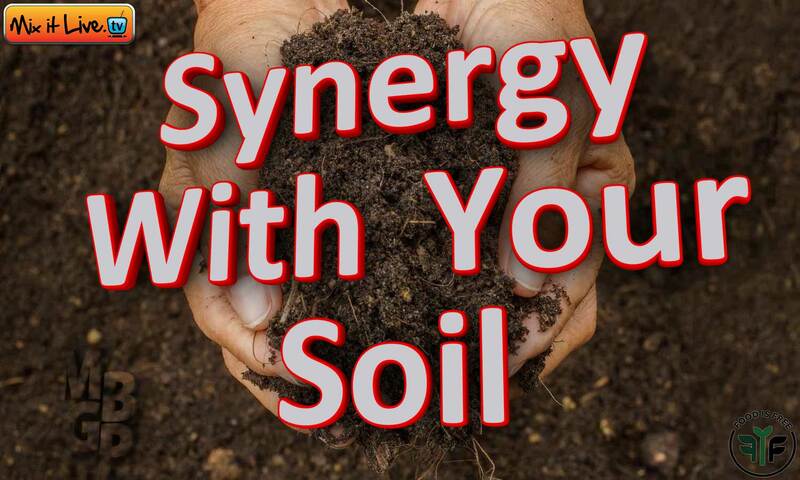 topsoil, mulch, recyled timber [pallets, old fence palings, different sized timber] and make into raised garden beds and pallet compost bins. 52 gardens later we can inform that it was a 'determined bunch of single Mums' who saw the value of growing their own healthy nutritious vegetables that were the driving force of the projects success. Mums who have become dab hands at de-nailing recycled timber from the tip, who learn how to use a nail gun, dropsaw and many other shared skills associated with gardening. 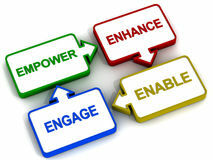 The 4 e's are a continuing live cycle within the project. People who join with little to no skills become sponges soaking up what we share and teach. 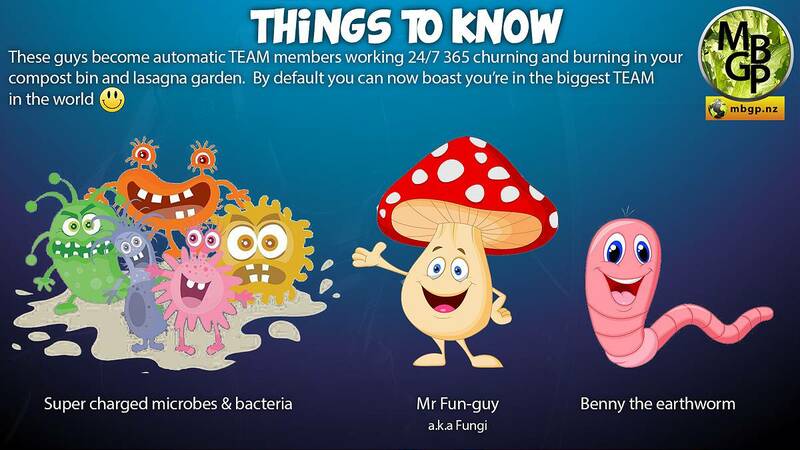 Each garden they help with they contribute more and more which is a great morale boaster for them and the TEAM. 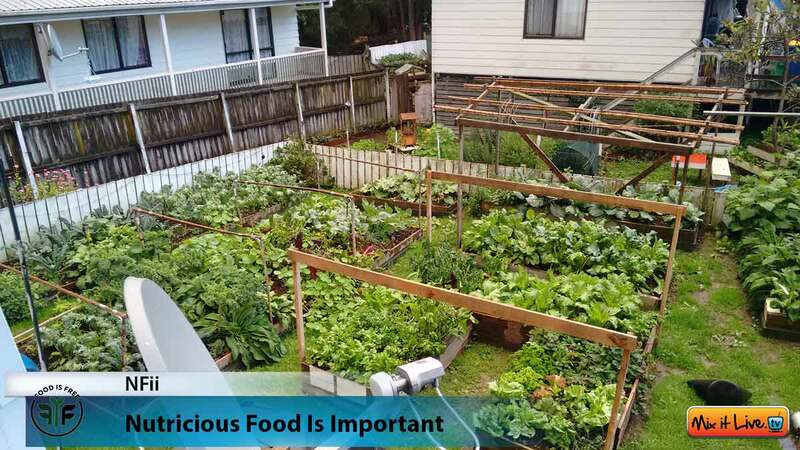 Empowerment is very much about: "Give a man a fish, feed him for a day; teach a man to catch fish, feed him for a lifetime"... and as we continue to build more gardens and see pictures of their gardens and harvest, it becomes evidently true. Humble beginnings to start something beautiful. 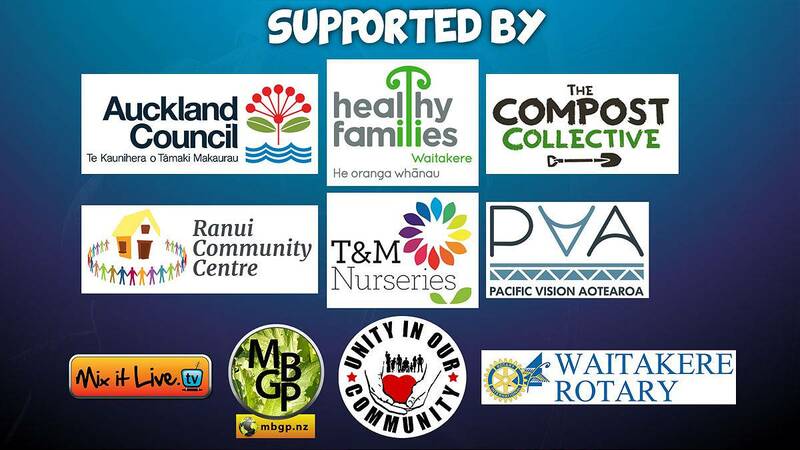 Through Healthy Families Waitakere, MBGP were introduced to Lincoln Heights School. Before meeting their Associate Principal [Toby Kite] we were told he was a BIG picture thinker. 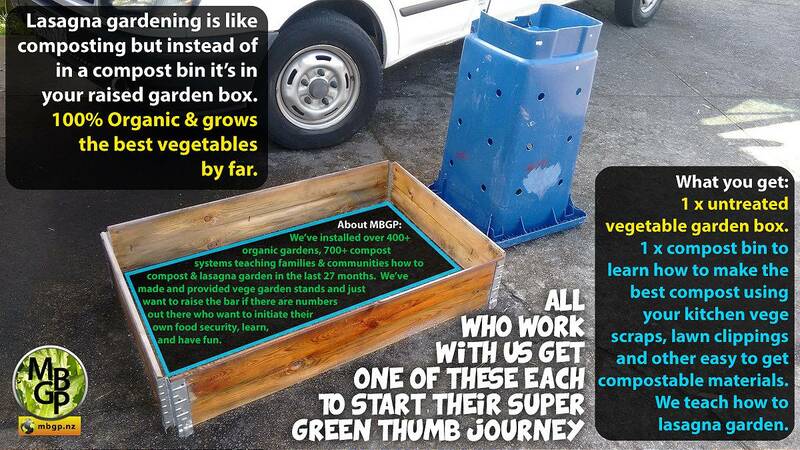 He wanted to increase his school's vegetable garden and composting footprint so MBGP provided all the resources 'free of charge' to do so. 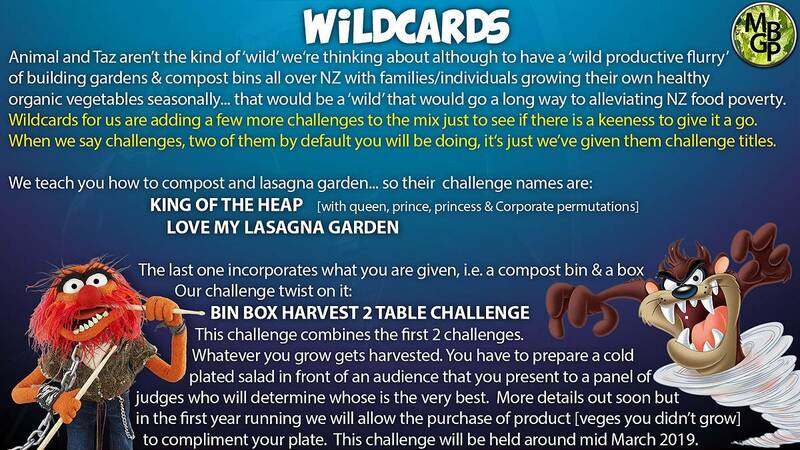 This next composting challenge aligns with kaiTOM VRace but can be treated singly teaching youngsters and families how to compost. 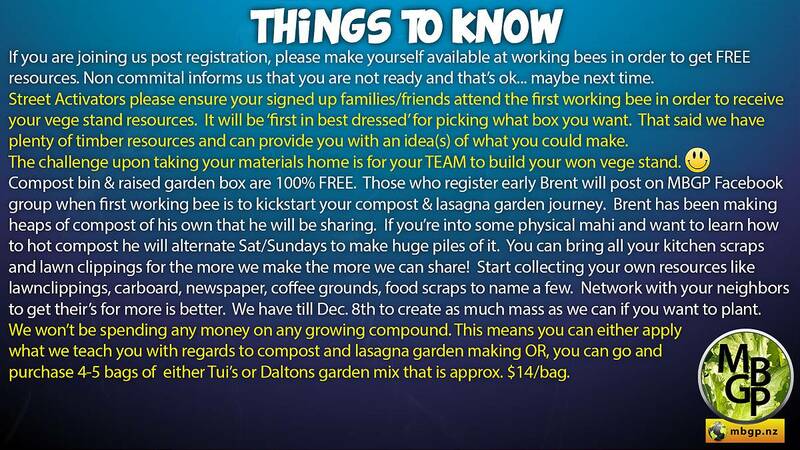 If this works positively for them then the next step is to hold a working bee in early 2019 allowing families to engage with us so we can teach them how to deconstruct pallets to make raised garden boxes to take home. 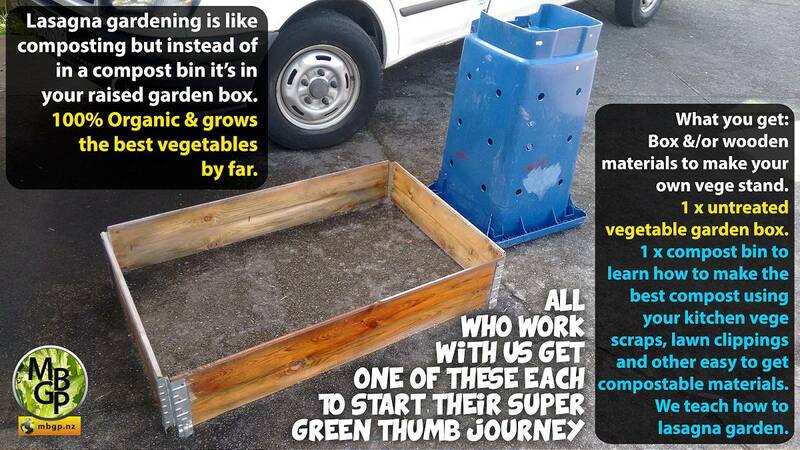 So humble beginnings start with taking a compost bin and composting to build with us and get a raised garden box to lasagna garden in to grow vegetables in by Spring 2019. 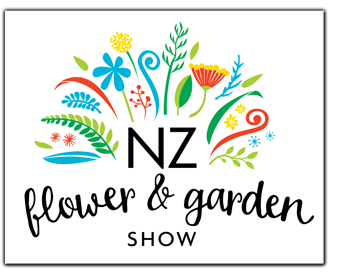 NZ Flower & Garden Show starts: Wedneday 28th Nov - Sunday 2nd Dec - 10am to 6pm daily. 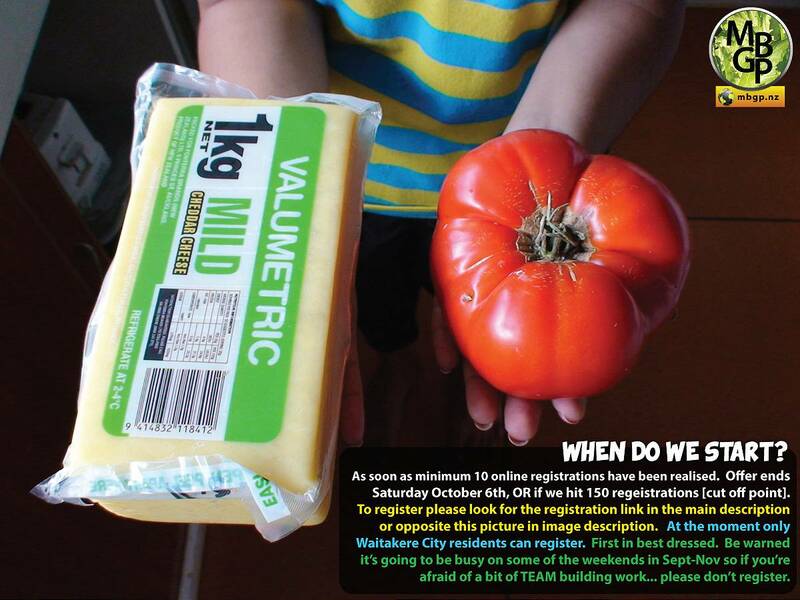 FREE starter packs up for grabs at this years NZFGS. 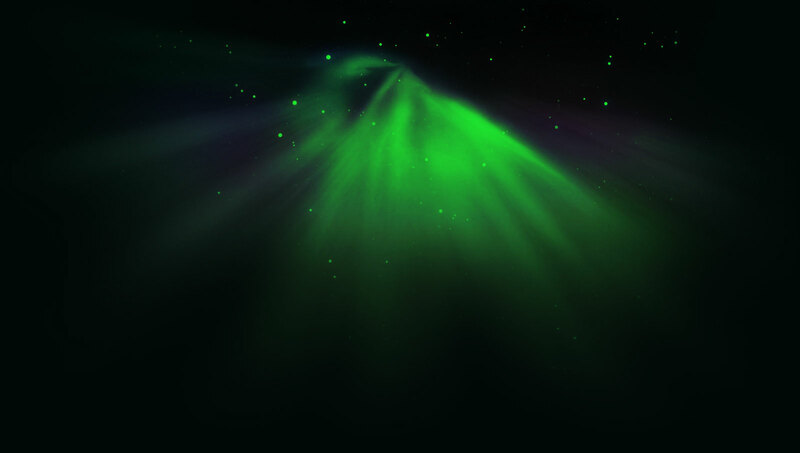 Details of 'how to' on VRace website. Hi everyone... it's been an interesting year connecting and doing gardens in the community this year. Plenty of challenges and insights gained. 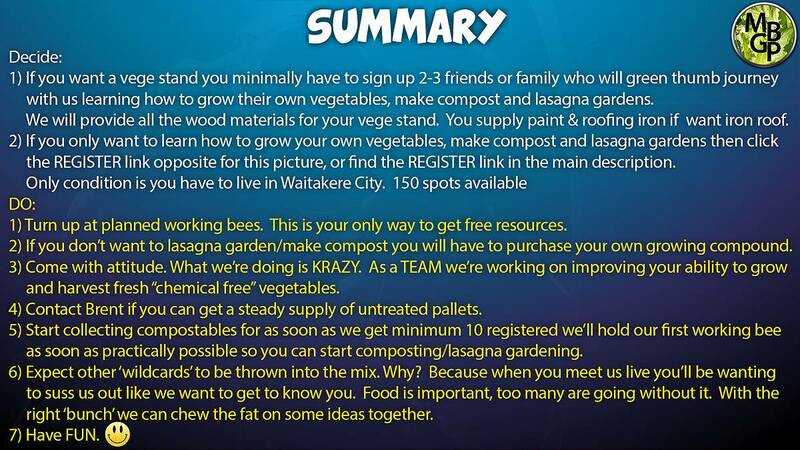 Thanks to all who have said yes to learning how to compost, lasagna garden, and grow vegetables. VRace is more of the same with more challenges added to up your game [or your TEAMs] from a knowledge and skillsets point of view. 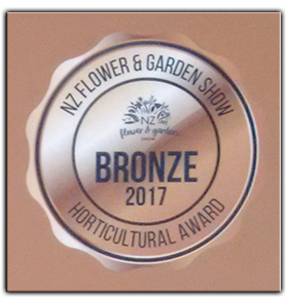 Plus the entertainment factor is meeting at next years NZFGS to see how our efforts stack up against the rest... woo whoo!! We've banged up a shell VRace website... more comprehensive details coming after the show/New Years... for we minimally have 420 compost bins as Christmas presents for a local primary school to prepare [finding out soon about another 800+ for more school youngsters]... so we're stretching ourselves for all the right reasons! Hi everyone... spring has sprung and a cracker day on September 1st and an interesting one today as I type [blustery, rainy... 4 seaons], September 2nd. We've been working on a few interesting things especially that of rolling what we're doing out beyond Waitakere City, i.e. 3-5hrs drive north or south [Details out soon for the 2019-20 new season]. 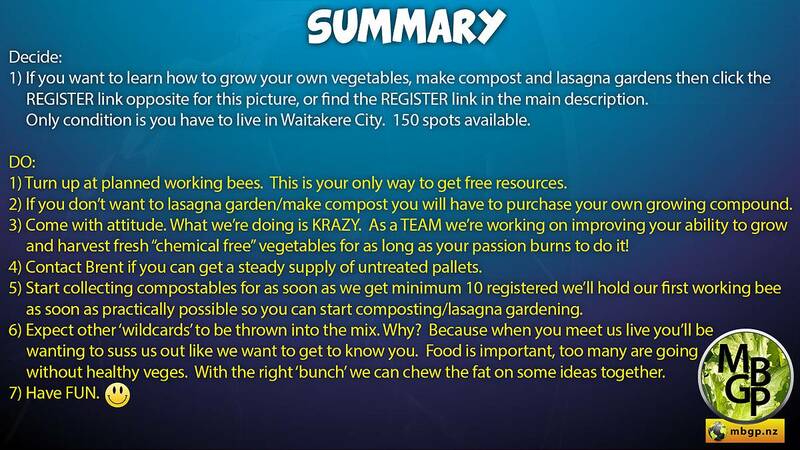 If what we are proposing is for you, or you know of anyone who has been thinking about vegetable gardening in Waitakere City, please share this with them. 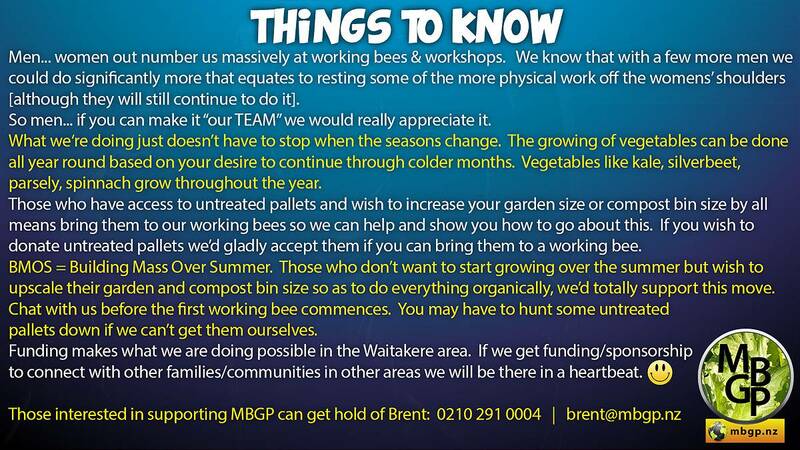 As soon as 10 register Brent will work out when the first working bee will be. You need to attend these to get free resources. 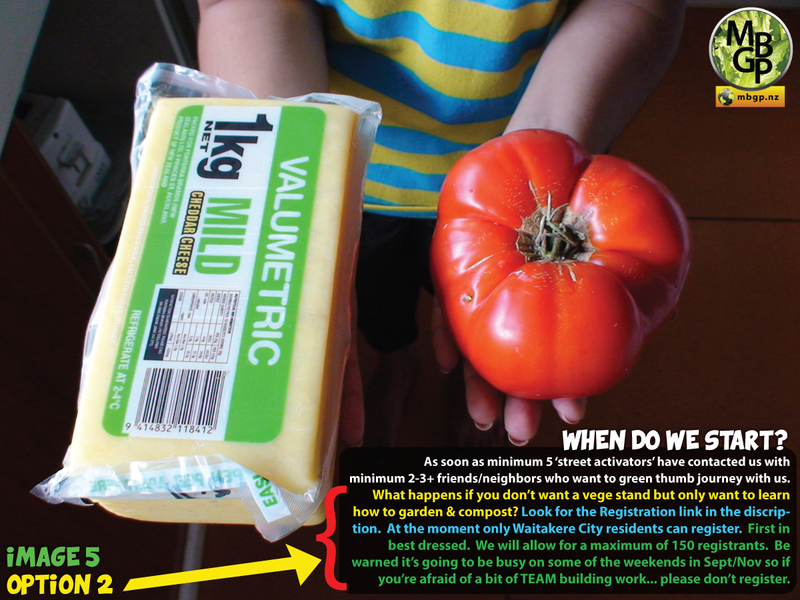 When we built 4 vege stands in April 2018 and more recently dropping materials off for a vege stand home-build, our thoughts have always been challenging those who are keen to grow for themselves and whatever surplus 'paying it forward' as fresh produce in their vege stand. 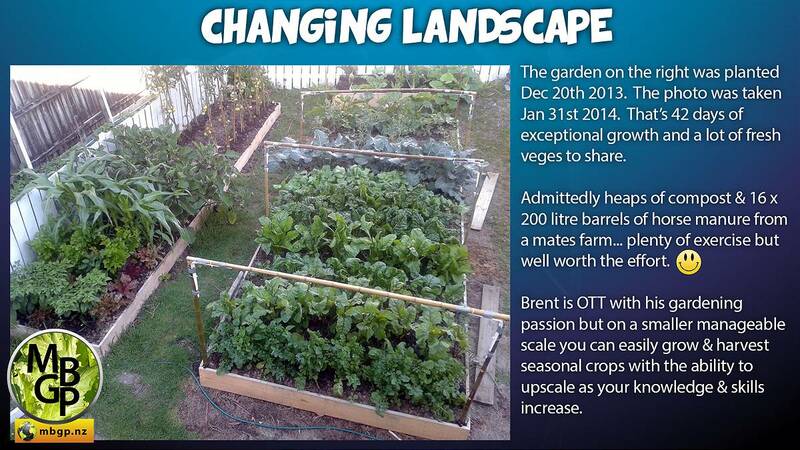 As growers ourselves we've always believed and promoted 'grow food not lawns' & the 'food is free' movement. Learning to grow isn't everyones cup of tea but it's well within anyones ability. So if this sounds like you, your street, and/or up to 2-3 neighbors & friends, we'd warmly welcome you as TEAM members and let's make it happen. 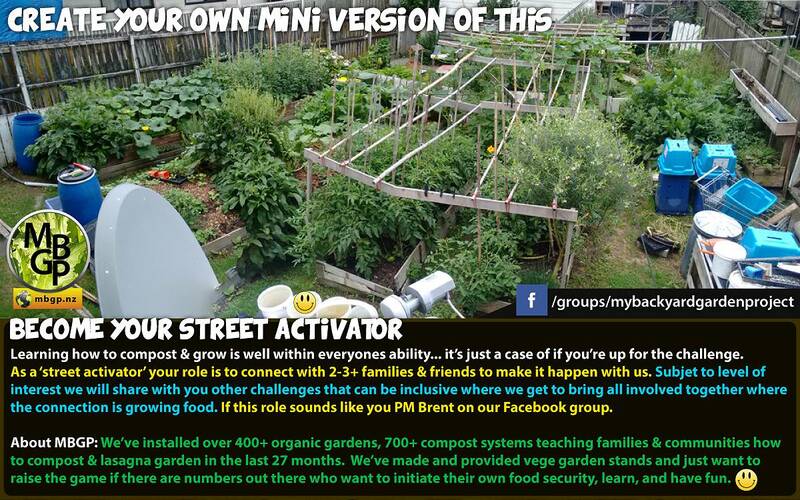 PM Brent if you want to be a street activator. Solid warm afternoon with a solid turnout of volunteers who came to Rutherford College for a solid workout of getting an area ready for all things to do with vegetable growing, composting, and lasagna gardening. It's always interesting being invited to work with others who are implementing aspects of how MBGP executes its own intakes. This was a partial trip down memory lane how we did things way back in 2016 inclusive of new format changes used in Rotorua in March 2017. 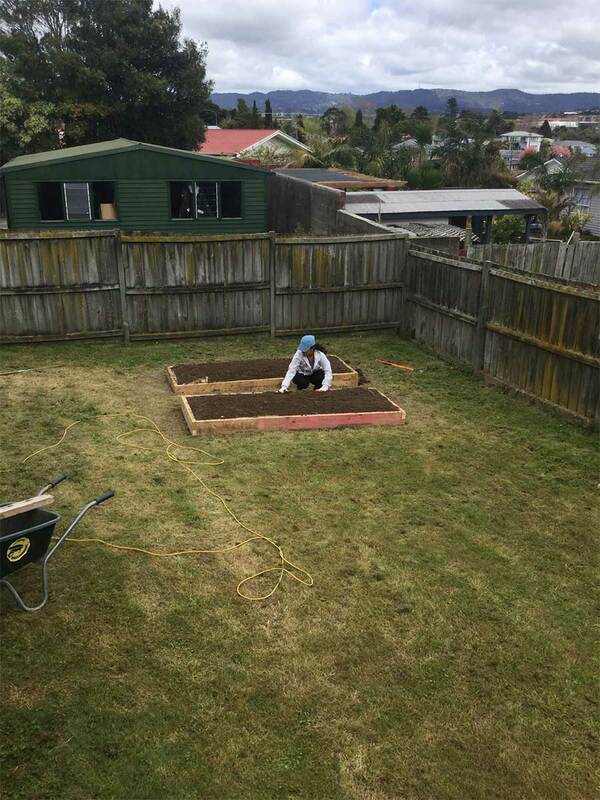 The underlying point on reflection is that Kelly Francis #whenuawarrior is positively doing something to help others also start their growing vegetables for themselves to feed themselves!! 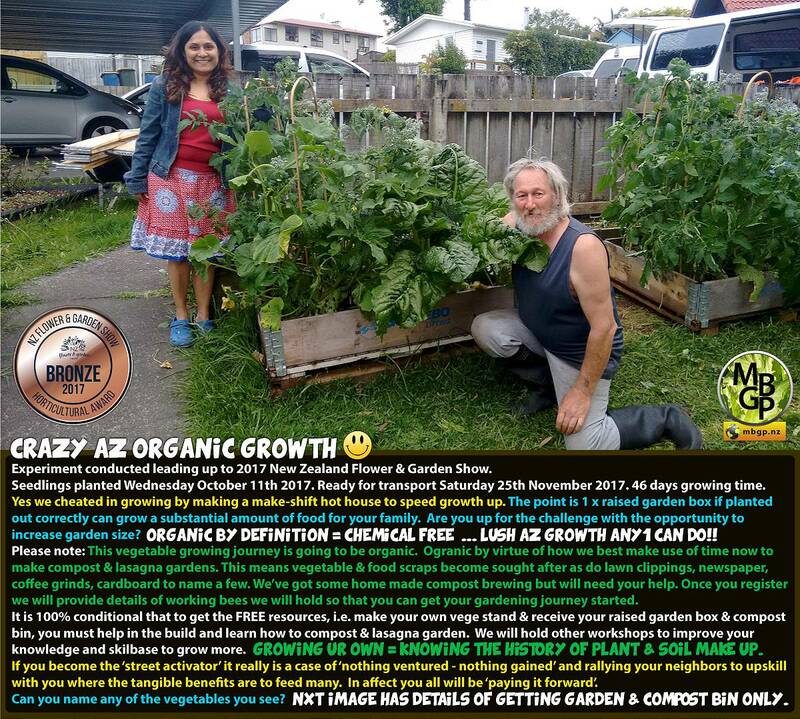 Dynamo Therese Mangos [PVA = Pacific Vision Aotearo, Compost Collective - wears 2 hats - talented!!] invited MBGP to a mid-morning interview at Kiribati Voice. Interesting to say the least. Everybody Eats and this was a memorable day for a host of reasons. Great work effort by all. Working with special needs whanau is always a rewarding and humbling experience. These youngsters work hard and try there best. Time and encouragement is the best thing to give them when you provide an opportunity for them even if it is just hammering in a nail. 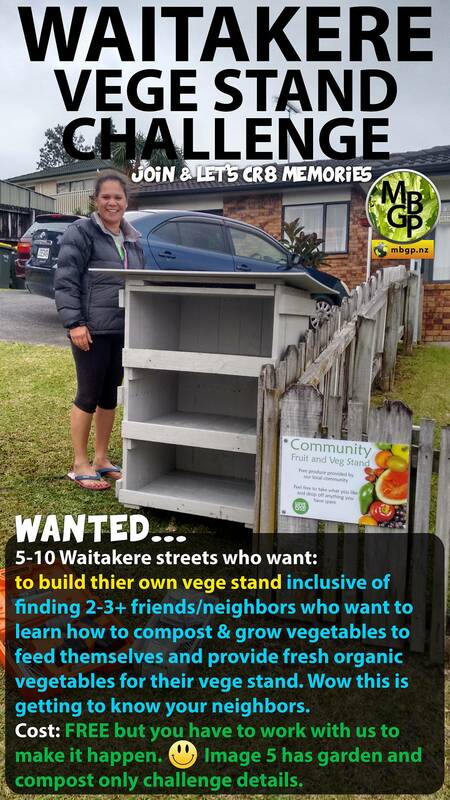 Thanks Mesapa Edwards & Therese Mangos for including MBGP with this gem of a community project. 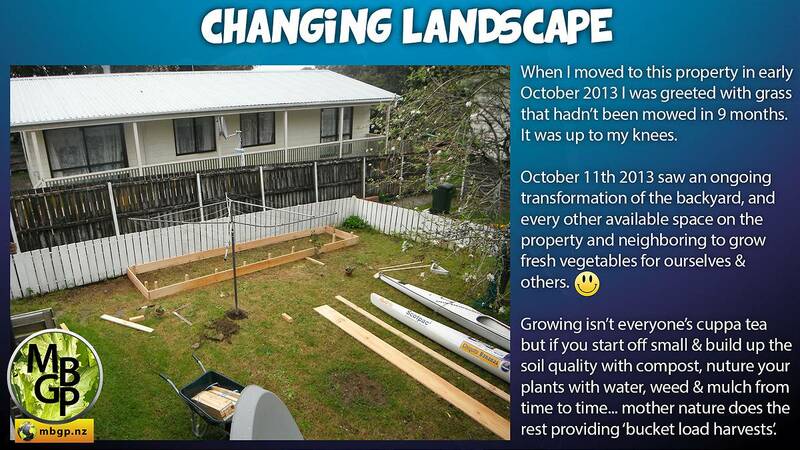 It totally amazes me how we spend more time working on other peoples gardens than we do our own. That said changes were planned with the focus on open pile composting. 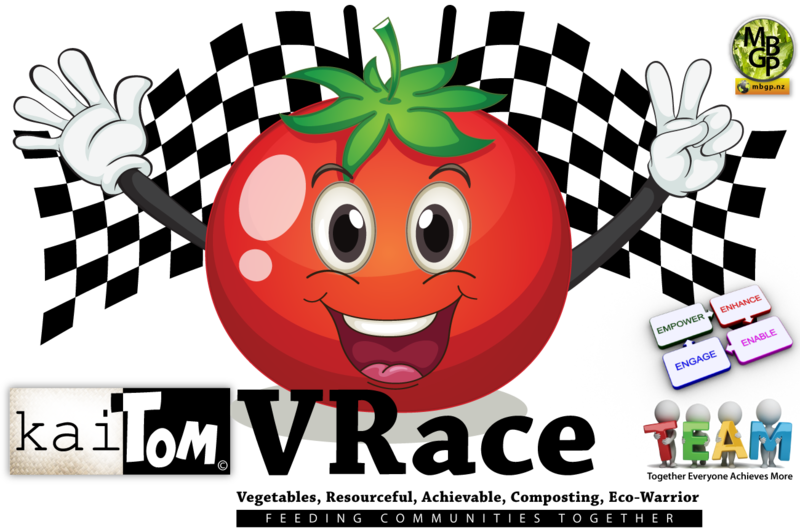 Serving the community provides opportunities to network with other super individuals/groups. We understand how to do things on the smell of an oily rag and make money go far on the least amount that we either have or have been given. So when we heard of the budget to do this audio gig [$800 plus], we said we'd do it FREE of charge. Thanks Warren for manning the MBGP display stall and doing a great job. 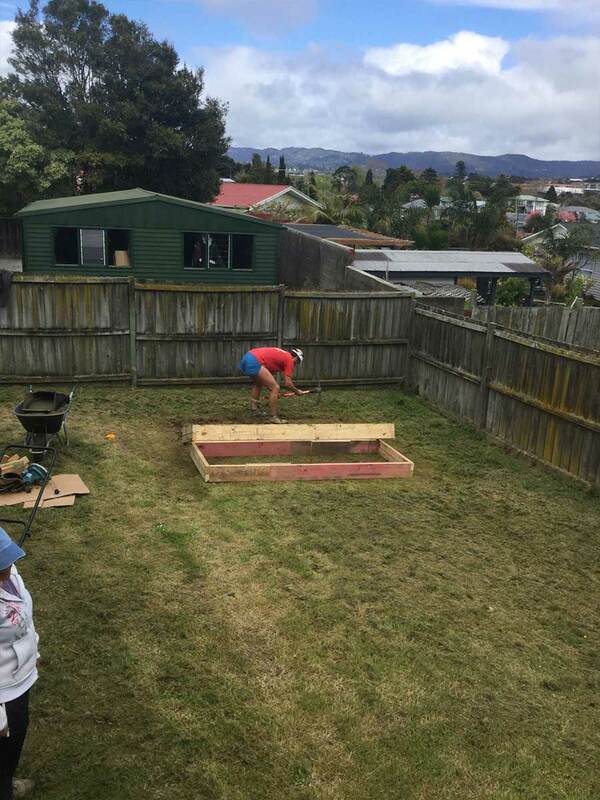 The call was to travel north and build a community garden for I Have A Dream in Tikipunga. We worked with a posse of youthful women who challenged the young men to come and help. Truthfully these young women outshone the lads hands down! MBGP offerend it's services to help out this young man Oscar who has a BIG heart for community. He fessed to us that he had little to no tools and was lacking in experience. We chatted and found out that his passion to serve the community kick-started before he was 16. What he lacked and shared with us was why we knew we were in the right space to help him on his journey. We were humbled to work with Oscar - thanks so much for inviting us. We do things for others because that's how we roll. 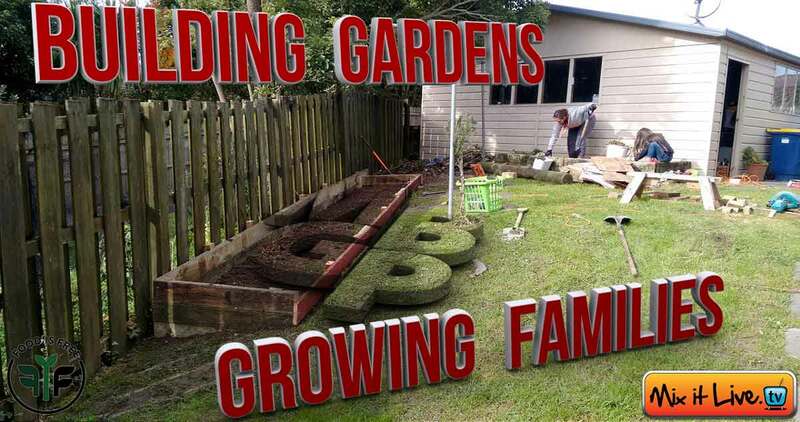 That said we are blameworthy of biting off more than we can chew sometimes, but this lil project was for a great course and is blossoming tremendously well in New Zealand. The bonus of getting dying trees chopped down is not only more sun, but a chat with the neighbor and she's cool that we start a new garden on the vacant property. 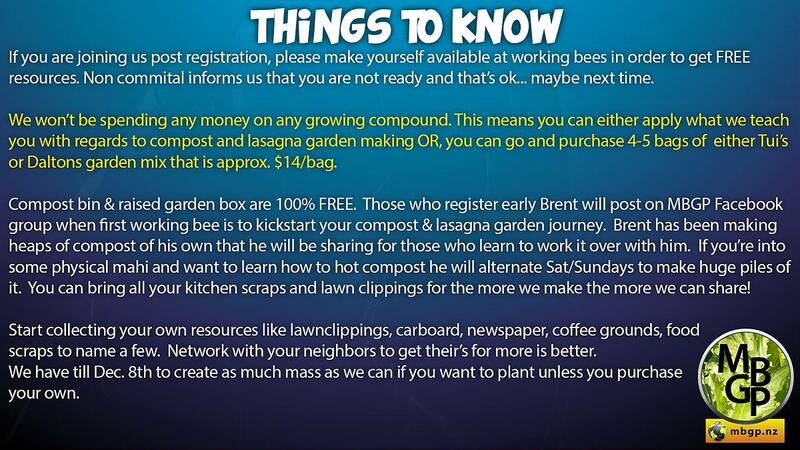 So for us it will allow us to build growing compound from scratch using a lot of sourced compostable materials. Plenty of work to do now. 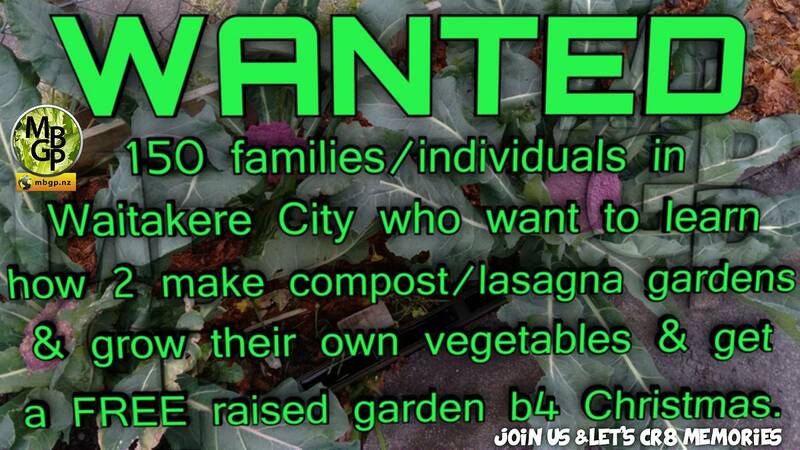 Amazing composting and landfill diversion opportunties await. MBGP exhibited at the 2017 New Zealand Flower & Garden Show. 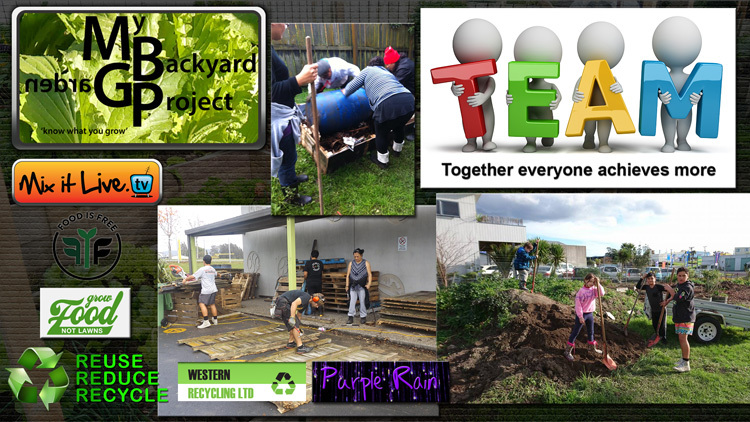 Completed - 1 primary/community garden at Kawakawa Primary School in 3 days! Completed - 127 gardens in 3 days! Completed - 80 gardens in 4 days! 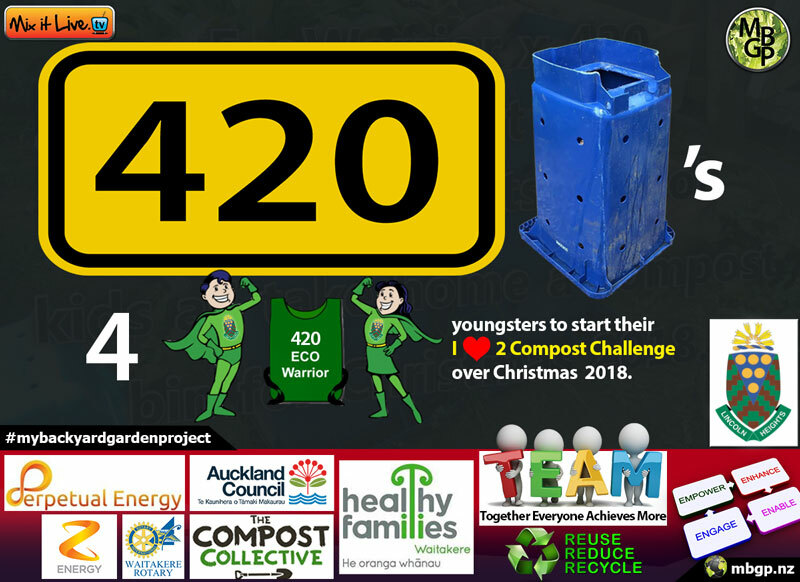 The TEAM challenge is to build 50 - 100 gardens in these areas in Waitakere City - Swanson, Ranui, Massey, West Harbour, and Henderson. New format to be run. 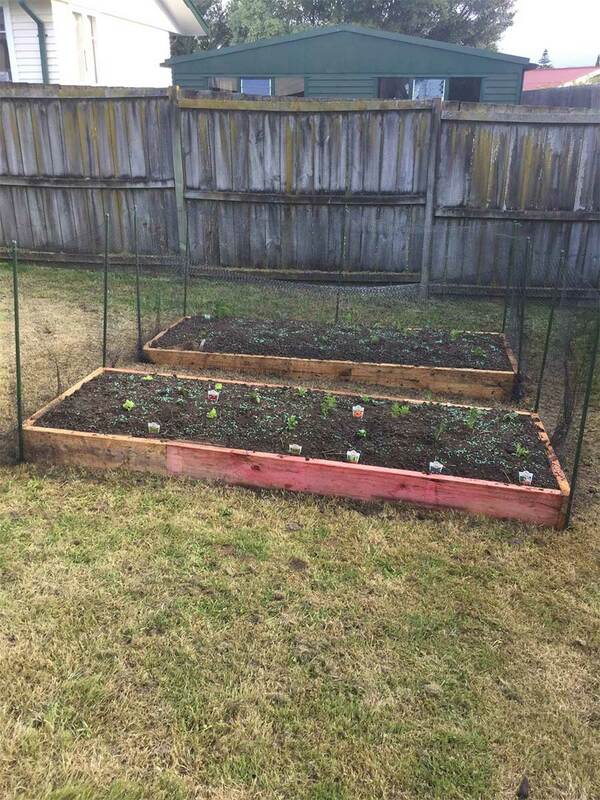 Completed - 66 gardens in just over 1 week! Like our gardens this page will change with content. 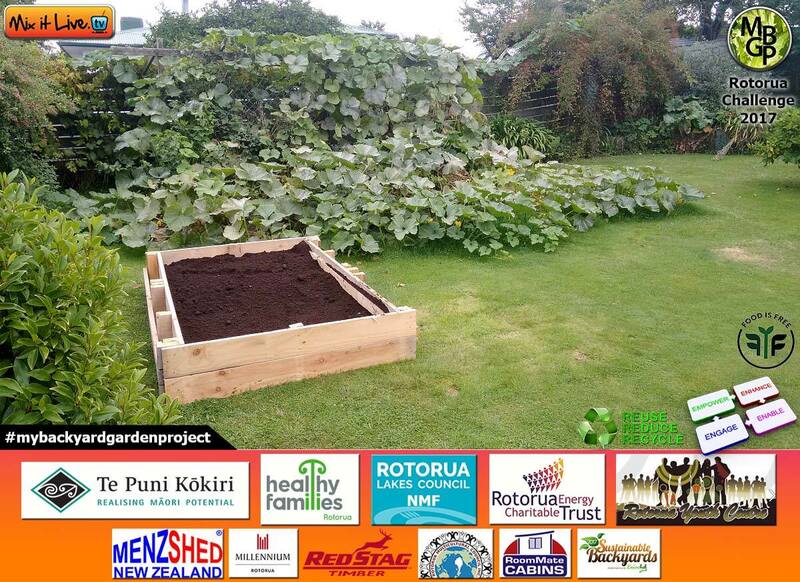 One of the 66 gardens built and filled with a super soil/compost mix - MBGP Rotorua Challenge 2017. This is where we have built. Because we travel we hope to be building a garden in your city/hometown soon in 2018. 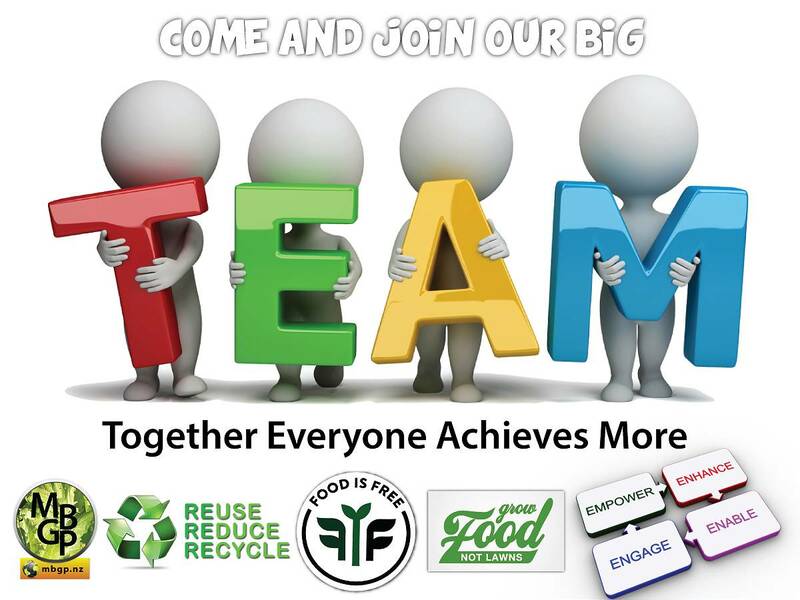 Here is what the TEAM are contributing in our Facebook Group - come and see.